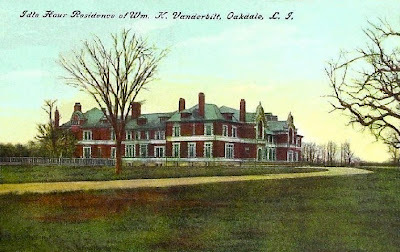 'Idle Hour', the William K. Vanderbilt estate designed by Richard Howland Hunt of Hunt & Hunt c. 1899 in Oakdale. Click HERE, HERE and HERE for more on 'Idle Hour'. Click HERE to see 'Idle Hour' on google earth and HERE on bing. Just so odd. So terribly odd. Idle Hour had what others do not love. It originally had ornate late-Victorian era interiors and a sense of the exotic. Similar to the Park Ave Armory in NYC, the interiors were what made it unique. No dull center hall Neo-Georgian with pediment out front. Been there, done that a thousand times, boring..... all classic, prim and proper and boringingly ho-hum, yawn. Before the disasterous fire (which was mostly heavy smoke damage throughout the home) Idle Hour's main staircase and entrance hall were magnificent, the stalactite ceiling and living room fireplace were so over the top outrageous they were insanely fun, the heavily beamed smoking room and dining room were lined with amazing panelled walls and I cant overlook that highly detailed wood screen wall. The quick and generic renovation that followed the fire discarded everthing that wasn't nailed down. No consideration was given to restoration at all. The home also has one of the best conservatories ever built on Long Island. With all the original furnishings and heavy drapes the interiors were dark in photos but they were like most of the time, just like Killenworth, Ormston, Insifada, Hempstead House, etc. In teh late 19th century, people rarely went to the shore or their summer house to sit in the sun and have their home flooded with the sun's hot rays. I look at Idle hour and see something out of the ordinary and that is what I like most about the house. You can keep your ten thousand other enlarged Neo-Georgians that are found anywhere and everywhere. Vanderbilt built something very unique here, unfortunately Dowling College gutted what was worth preserving. I remember reading somewhere that this very large version of 'Idle Hour' functioned like a hotel, more so than many other large Gilded Age estates; although it looks more like what it became -- a building on a college campus. Question: is 'Idle Hour' or 'Indian Neck Hall' the oddest LI estate in terms of just not looking like a country house? If you'd built Marble House and then given it away to your soon-to-be ex-wife, how could you ever settle for this? There's something about it that recalls some of the work of the elder Hunt (the Marquand house, for instance), but not in a good way. A clumsy hand, inside and out, and a sense of style that had already become passé. Couldn't have said it better Ancient (and was firing up the keyboard to try when your comment came through). I don't argue that the interiors had some marvelous moments---the Jacobean ceiling with pendants that you reference, the medieval staircase, and other features. But, Hunt pere produced two of the greatest houses of the Gilded age for this man, and les Hunts fils were not equal to the task. The quality of craft and construction is without dispute, but the house is unfriendly, forbidding and strange---almost no reference to site, none of the thousand graceful touches and openness that make many Beaux arts houses warm and light, and give a sense of movement and invitation (cf the Garrett house at Newport, Marble House, etc.). I have no allegiance to any particular style---good is good, and bad is bad, regardless of size and materials. What I do have allegiance to is how well the architect and client perform the task of building a structure that ornaments its site, and makes living a pleasure, not a series of sealed events in elaborate boxes. Perhaps the problem here is that it was never painted in its heyday by Thomas Kinkade. Ancient- who knew that you were a Thomas Kinkade fan (only joking). By the way, Kinkade died last week in somwewhat mysterious circumstances, after a losing a lawsuit accusing him of swindling some art dealers and a DWI conviction. Following news of the DWI, A genius commentator on the website Gawker photoshopped a picture of a post car crash Cadillac Eldorado and a man urinating against a tree onto one of Kinkade's bucolic cottage-in-the-woods scenes. Priceless. Sadly, though, I fear that there are not enough pastels in the paintbox to make Idlehour even in the slightest charming. I once dated someone who initially introduced himself as 'working in a gallery'. Yup. A Thomas Kinkade Gallery. He had a lot of trouble keeping a straight face talking about his job. PS Archibuff, others do actually love late Victorian or Edwardian interiors, and even agree that the big room at Idle Hour has something going on---but this other's affection stops at the exterior of Idle Hour, as strange an animal as ever was invented. If you expanded that question to include ten houses, how many would be attached to the Vanderbilts? I have been searching this blog for posts on the Vanderbilt mansion on Eagles´s Nest, but dont find any. Can someone please advise a link for this? You're not finding it because it has yet to make an appearance on OLI. Heavy handed and institutional? Check. What the heck were they thinking with those gable ends? Check. Wrong house on a great site? Check. Odd orientation to the waters edge? Check. Outdated even before leaving the drafting board? Check. Unique and interesting interior layout? Check. Original interior like a Candyland fantasy in plaster and wood? Check. Rooms that you wear like jewelry moreso than merely inhabit? Check. Extravagant and view killing Hogwarts style collanade? Check. Crystal-like Palm Room where I'd like to spend portions of a day or two? Check. Who needs the outdoors when you have all this great craftsmanship to enjoy inside? Check. Grateful that it is still extant and in use? Check. Enjoying everyone's critique of it? Check. A houlse I would dislike if I didn't keep finding so many things about it that I enjoy contemplating? Yes. Wow its going to be beat up on the Vanderbilts day, well it gives CPH a rest. DED I know you have previously pointed out the craftsmanship and fine quality of some of the interior work. You get a pass today, just barely! I love the wonderful Karl Bitter frieze in the dining room, the outrageous living room fireplace with organ pipes, that awesome plaster ceiling, The Diana Goddess of the Hunt above the Dining Room mantle, that wonderful staircase, I could go on and on. I like the interiors for their variety and unique qualities from the typical expected staid rooms one usually finds, whether they were past their expiration date or not when completed. Plus its a masculine interior without doubt. I grow tired of just hearing compliments about yet another French panelled sitting room or Georgian dining room. I prefer a client who wanted something different and the Vanderbilts usually provided that in spades, also with a nod to Delamar. So what if the exterior is heavy handed? I live inside! Plus I'm partial to dark panelled interiors, i.e. Ormston, Insifada, Killenworth, etc. so Idle Hour is a perfectly ominous grand eclectic pile. Thumbs up. I also dont see what the issue is with not looking residential since many of these homes were in fact hotels. They functioned as hotels and accommodated dozens of guests and their servants. I would check in anytime they wanted me. My nomination for Long Island Hotel is the final expanded version of the Charles Steel house in OW. It looks like a massive 19th century country resort hotel and definitely not a home, but again, who cares, it was in reality a hotel. Ancient, if I added 'Beacon Towers' to the list does that count as Vanderbilt or not? Even if 'Beacon Towers' didn't look like a LI country house it should still be standing there, gathering looks of amazement. I caught a glimps of a piece on Idle Hour last week on News12. Though I could not hear, either the town of Oakdale agreed to raize the house and build condos, or keep the house but sub-divide the property for condos. Could not find the article on News12 website. You have confused Idle Hour with Indian Neck Hall. And the plan was for condos on the grounds and a rehabilitation of the house. There is no way St. John's is going to demolish the house. You are still confused. Idle Hour is indeed part of Dowling College. But we're talking about St. John's and Indian Neck Hall...same town...different house/school. Zach, does the rehabilitation of 'Indian Neck Hall' include pulling up that second capital from the right over the front door that has slipped down like a lose sock? Jeff's March 25, 2011 observation is still one of the great catches here (my opinion). loose sock ... sori 4 not pruf reeding. Great comments and I have to agree. This is the second version of Idle Hour - the first designed by Richard M. Hunt but later destroyed. Anyone know how the two houses compare? The Hunt brothers lacked the skill of the father. Thank you. DFP...who knows what they would even consider to qualify as a "rehabilitation".